On the afternoon of April 26, 1925, Chesterton area residents Frank J. Cook and Fred A. Ruhe struck out in Ruhe's automobile to go hunting for mushrooms in the northeastern portion of Westchester Township in Porter County, Indiana. That Sunday, as Ruhe drove along Mosquitotown Road (present day County Road 1400 North), his companion Cook noticed an odd looking object along the road that appeared somewhat charred. Cook gave little thought to what he had just seen and the two mushroom hunters proceeded on to collect nature's bounty. Curiosity regarding what he had seen along the road, however, ate away at Cook's mind while combing the woodlands for mushrooms. When the pair was traveling back to Chesterton, Cook asked that Ruhe drive more slowly as they passed the location where Cook thought he had seen a burnt object earlier that day. As they approached, they stopped at the object Cook saw and discovered that it was the charred remains of young woman. The remains were found "at a point near the west corner of the center [farm] field" on the August Herman Pollentske farm between County Road 200 East and Brummitt Road. 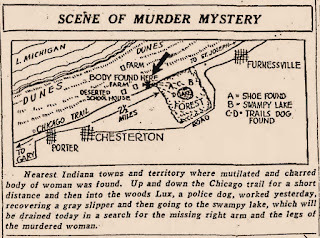 Immediately upon their gruesome discovery, Cook and Ruhe drove into Chesterton and reported what they had seen to local physician Dr. Charles O. Wiltfong. Wiltfong then conveyed the information to the Porter County Coroner, Dr. Allen O. Dobbins, and Deputy Sheriff William D. Pennington. The body lay when discovered face down, with one hand bent under the face. One arm was burned off at the elbow, and both limbs below the knee were gone, the bones looking as though they had been hacked or broken off. The torso was badly charred, but the flesh of the back and the flesh of one hand had escaped the flames. Two bullets had been fired into the back of the head of the victim, and these made holes probably an inch in diameter and eight or ten inches deep in the ground. These holes were filled with blood. Both bullets were recovered by Deputy Sheriff Pennington. Both were shot from a .38 special. One was steel jacketed, and the other copper jacketed. This evidence convinced the coroner that the woman had been killed on the spot where she lay. Near the body was an empty five-gallon can, which had once been used to hold polarine oil. It is supposed that the can was filled with either kerosene or gasoline, and the contents had been used to burn the body. Little of the clothing had escaped the flames. A piece of lining from a coat sleeve was left. Around the neck of the victim was a string of glass beads. The coat worn by the woman had a fur neck piece and this protected, in a measure, the back of the head. Laying on the ground was also found the remains of a vanity case, two eye glasses that had dropped out of their holder, the wires that held them together and a burned pocketbook. The face was burned so that identification would be impossible. Indications were that the legs of the victim had been hacked off. No signs of shoes were found. Some bones were found about ten feet from where the body lay. Near the body was found the charred remains of a copy of Saturday's issue of the Gary Post-Tribune, and a Pennsylvania railroad employe's card. On the railroad card the name had been obliterated. It stated in print: "Northwest region, Pennsylvania railroad," and below this was written in ink: "No. 1032." Given evidence at the scene, investigators quickly determined that the murderer or murderers drove to the remote location to kill the woman. Their automobile was driven from the east and, for a few hundred feet, ran along the north edge of the road with the passenger side wheels rolling through the grass. The tires on the automobile were thought to be Goodyear balloon cord tires. The automobile stopped and the victim was apparently pushed out of the vehicle, falling face downward, and then shot twice in the head. It was later learned at an autopsy conducted by Coroner Dobbins that the woman had also been stabbed in the heart. concerning murder victim found on Mosquitotown Road. Residents in the surrounding area reported that they had heard gunshots between four and five in the morning of April 26, and it was believed that the bullets from those gunshots killed the victim. Within a week, the dead woman was identified as Josephine Desiderio, a resident of Gary, Lake County, Indiana. east-west road next to the arrow is present day County Road 1400 North. Source: A. I. Silander & Company's Plat Book: Porter County, Indiana, 1928. Initially, there was considerable confusion as to the identity of the murder victim. One issue confounding the quick identification was the amount of destruction and disfiguring the fire had caused to the body. Newspapers across the the Midwest and beyond were reporting the story, but had no name to associate with the unfortunate victim. As a result, numerous individuals across several states were stating that they believed the body to be that of a young woman they knew who had mysteriously gone missing. The remains were removed by authorities to the undertaking room of Chesterton mortician Hallard A. Flynn. Here, it was reported, more than 2,000 people came to view the young woman's body. Most of these people were curiosity seekers, but several had purposely traveled to Flynn's morgue to determine if they could identify the woman's body as being that of a missing friend or relative. On May 2, James A. Brown, of Fort Wayne, Allen County, Indiana, stated that the body had a strong resemblance to his missing niece, Mabel B. Wahls Miller, age 23. Brown reported that Mabel had married Ellsworth C. Miller two years earlier and that they frequently quarreled with one another. Ellsworth informed Brown that Mabel has been missing since April 6, but believed that she had gone to Columbus, Franklin County, Ohio, where he believed she may have drowned. Brown told Porter County authorities that Mabel had worn shoes similar to the one found near the body by a search dog. Closer to the scene of the crime, Michigan City resident Artianeca L. Hossler said she was absolutely certain that the remains in Flynn's morgue were those of Mary Berg, age 22, her daughter and the wife of a railroad employee. Upon investigation, however, Mary was found to be alive and well and living in Danville, Vermilion County, Illinois. Meanwhile, Frank Kocurek, a former Army butcher, was arrested in Chicago after an acquaintance, William Littleton, informed police that Kocurek had threatened to kill his wife. During interrogation, Kocurek initially told investigators that the Mosquitotown Road woman might be his wife, but then he produced a letter from his wife dated May 12 saying that she was returning to her home in Detroit. Newspapers reported that "Kocurek was hysterical after several hours of interrogation and frequently became incoherent." He was later released when no connection could be made between Kocurek and the body found in Porter County. Raymond Sweeney, a railroad engineer, was taken into custody twice in connection with the murder. Later, it was established that the woman declared by three witnesses to resemble the mutilated remains and to be the wife of Sweeney was alive in Farina, Fayette County, Illinois. Several pieces of evidence were gathered at the crime scene and from the remains that allowed detectives in the case to positively identify the body. Evidence included a gold vanity case found at the crime scene, remnants of a coat and undergarment found on the victim, a slipper-like shoe discovered near the body, and characteristics of the body itself, most notably the victim's teeth. Circumstantial evidence gathered from individuals allowed investigators to tie these pieces of physical evidence to a possible perpetrator of the murder. Two individuals were especially important in the identification of the remains. Florence Boto, a 16 year old companion of Josephine Desiderio, who at the time was using the alias Florence Kish, testified at a coroner's inquest about evidence that was discovered and her relationship with the presumed victim. Florence was able to positively identify the coat that the victim was wearing was her own and that she had allowed Josephine to borrow it. In addition, she stated that when she had last met Josephine that her friend was not wearing any "underskirt," and that she gave her a silk underskirt of her own that she identified as being the one worn by the victim found on Mosquitotown Road. Finally, Florence indicated that the teeth on the body were the same as Josephine's; the upper teeth had a distinctive gap, there was a noticeable overbite, and the teeth were in excellent condition with no signs of decay. 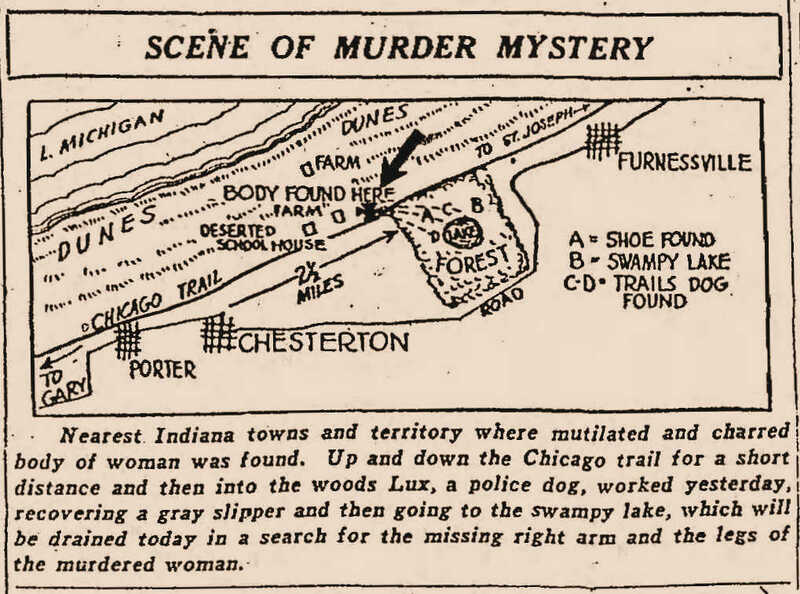 She was a woman of many loves, the object of many "Lady of the Evening" toasts in Gary's fervid night life, and it was her pencilled [sic] notation of spots of rendezvous which identified the newest murder victim of the Indiana dunes as Josephine Desiderio of Gary. Police, backtracking on the trails of her loves, sought today to trace the hand that drove steel through her heart, sent pistol bullets through her brain and all but blotted out identification. Her husband, Louis, is missing. The police know him as a bootlegger and the habitual toter [sic] of a pistol. They know of him as passionately and insanely jealous of his butterfly wife, whose mass of bobbed brown hair and twinkling blue eyes and fast dancing feet brought smiles of a dozen men whose names the police have learned. Investigators honed in on one particular person who was known to have had a recent intimate relationship with Josephine, a man named Sam Rossi. Sam had resided with Josephine in a Gary hotel for about 20 days prior to her disappearance. The Porter County Sheriff was quick to find and put Rossi into custody as a material witness; Florence Boto was also taken into custody for a brief time as a material witness. Under oath at the coroner's inquest, Rossi detailed his relationship with Josephine, identified the remains as Josephine's by the appearance of the teeth, and stated that he was familiar with the gold vanity case that was found at the scene and knew it to be hers. He also had an alibi that clearly established that he could not have killed Josephine. At the coroner's inquest, Florence testified that Josephine was the mother of three children. Two children lived at home with her husband Louis, while an infant resided with Josephine's parents. One finding from the autopsy was that the victim was either pregnant or had recently given birth. Later, Coroner Dobbins stated that the body found on Mosquitotown Road may have never borne children. Given the extensive damage to the body and nearly complete destruction to the abdomen and lower extremities by the fire, as reported in several newspapers, the coroner may have had an impossible task in making a definitive conclusion. 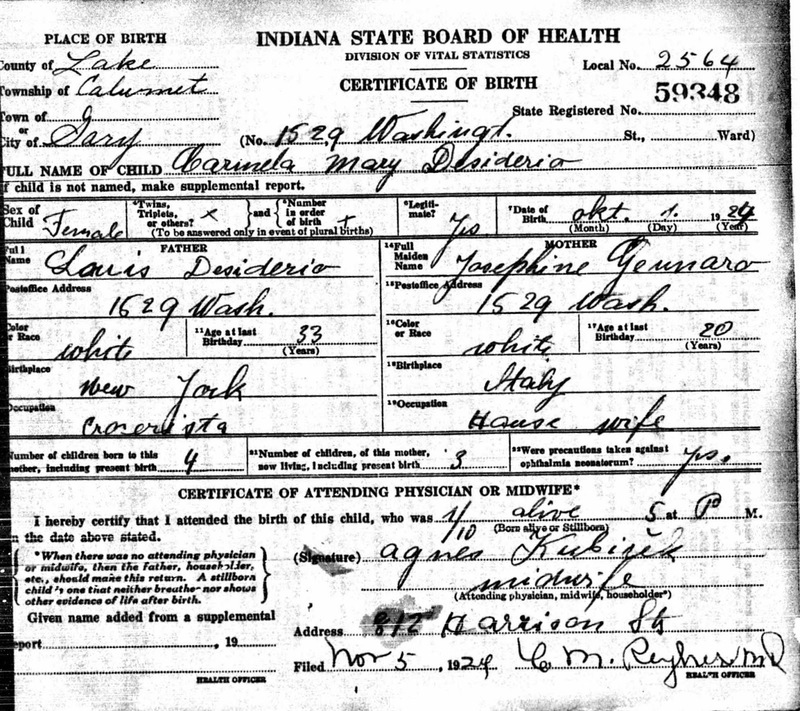 Birth certificates exist for at least three of Josephine's children, however, indicating that she had indeed given birth to children. Bernardo Gennaro, Josephine's father and a Gary grocer, was a bit uncertain as to whether the remains were those of his daughter. However, examination of the victim's teeth led him to believe that the the body was indeed Josephine's. Coroner Dobbins released the body on Saturday, May 9 and that same day undertaker John Oleska from Gary arrived to take the body for burial. Josephine was buried that evening in Gary's Oak Hill Cemetery in plot B36. No religious ceremony was held. In a rather strange twist, the Gennaros did not sign a deposition that stated that the body was indeed that of Josephine, but they did provide a receipt for the acceptance of the body and provided proof that the body had been buried. 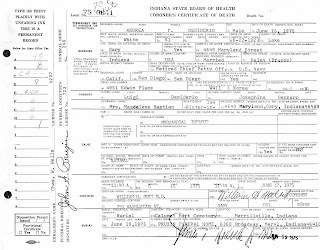 Coroner Dobbins signed a death certificate for Josephine Desiderio on the day she was buried. 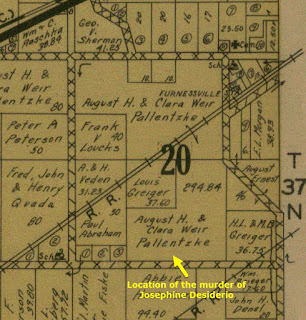 Dobbins indicates that Josephine came to her death at 4:00 am on April 26, 1925. The coroner's inquest determined that the cause of death was "Homicidal - Knife wound in chest and gun shot wound in head." Josephine Desiderio. Certificate number 14771 filed May 14, 1925. Source: Indiana State Board of Health. Investigation by Coroner Dobbins and Porter County Sheriff William B. Forney gathered additional evidence and a grand jury was empaneled by Judge Hannibal H. Loring in the Porter Circuit Court in Valparaiso. The foreman of the grand jury was Valparaiso resident George Freeman Beach. The other members of the grand jury included Porter County residents Arthur O. Carpenter (Boone Township), Amos J. Casbon (Boone Township), George J. Drazer (Pleasant Township), Charles Fuller (Chesterton), and Clara M. Kirkpatrick (Valparaiso). The evidence and testimony provided at the coroner's inquest was also presented to the grand jury, as well as new details concerning Josephine's husband, Louis Desiderio. For instance, it was learned that five months prior to Josephine's murder that her husband had beaten her. She had obtained a $500 peace bond, similar to a temporary restraining order, to keep Louis away from her. The peace bond was still in force when Josephine was killed. In addition, there was testimony from more than one witness that Louis had threatened to kill Josephine a week before she was found dead on Mosquitotown Road. The most damning fact pointing to Louis' involvement in Josephine's death is that he could not be found after April 26 - he simply disappeared. General map of location on murder scene and evidence. Note that this map is incorrect in placing location of the murder. Source: Chicago Daily Tribune, April 29, 1925. The totality of the evidence and testimony led the grand jury to indict Louis Desiderio with the first degree murder of his wife, Josephine. Police in Northwest Indiana and Chicago were now hunting for Louis to bring him to justice. Some had doubts as to Louis' guilt. Captain William Lynn of the Gary Police Department, for example, was quoted in several newspapers stating that "Louis Desiderio may not be the man who killed her, but Louis knows of her comings and goings, and her friends and haunts in the white light resorts of the whole country. He may be able to clear himself of all suspicion by showing whose hate or whose passion might have inspired the killing." Alternatively, Captain Lynn may have made such a statement as a ploy to persuade Louis to turn himself in for questioning. It should be noted that within a week of the murder and soon after preliminary identification of the remains as being those of Josephine Desiserio, two of Louis' brothers and a cousin, Claude A. Ferini, were taken into custody by the Chicago Police Department. These men denied knowing the whereabouts of Louis and also stated that they had opposed his marriage to Josephine. They were soon released. Louis Desiderio was born Luigi Desiderio to Andrew and Maria (Ferretta) Desiderio on July 15, 1891, at Celano, Italy, a small town located approximately 75 miles directly east of Rome in central Italy. Nothing is known of Luigi's childhood, but it is known that he set sail for America on the S.S. Niagara from Le Havre, France, and arrived at New York City on July 23, 1912. 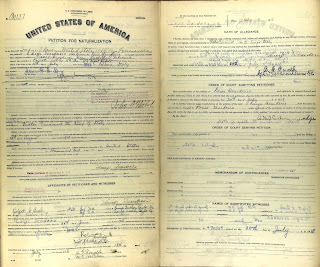 The passenger manifest for the ship lists him as 21 years old, traveling alone, in good health, standing 5 feet 7 inches in height, chestnut hair, brown complexion, and brown eyes. Luigi's final destination is listed in the manifest as Gary, Indiana, where a brother was living. entering the United States on July 23, 1912. Source: National Archives and Records Administration. Nine passengers on the S.S. Niagara, including Luigi, were detained for further investigation before being released by immigration officials. The immigration record shows that the cause for Luigi's detention was "lpc 310." The acronym "lpc" represents "likely to become a public charge," which meant that there were reasons for the immigration officials to believe that Luigi would not be able to support himself financially, or perhaps there were medical or mental conditions present that would require public intervention. Luigi was detained for three days, being released on July 26 at 4:10 pm. 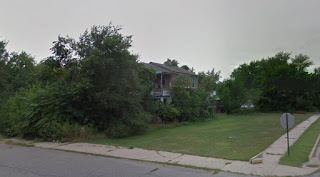 Soon after his arrival to America, Luigi Desiderio can be found residing at 1610 Madison Street in Gary, Indiana, with Fiorentino (also known as Fiore), Frank, and Ricco Desiderio. All four were employed as laborers for the American Sheet & Tin Plate Company. Historical records dated between 1912 and 1918 reveal that Luigi used the names Luigi, Louie, Louis, and Luis interchangeably. Madison Street in Gary, Lake County, Indiana. By 1918, Luigi was residing at 2005 Broadway Avenue in Gary, near his brother Fiore's automobile parts supply business. He enlisted in the United States Army on May 25, 1918. While in the the Army, he filed a Petition for Naturalization at the United District Court of Kentucky at Louisville and took the Oath of Allegiance to the United States on July 20, 1918. The court order admitting Luigi as an American citizen was signed the same day he took the oath; this order also legally changed his given name from Luigi to Louis. Hereafter, records reveal that he always, without deviation, used the name Louis when providing identification. Registration Card, dated June 5, 1917. Oath of Allegiance to the United States, dated July 20, 1918. 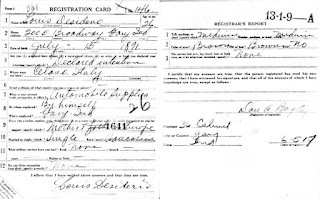 At the time of his naturalization, Louis Desiderio was a U.S. Army private in the 60th Company of the 15th Battalion, 159th Depot Brigade at Camp Zachary Taylor in Louisville. This military processing facility trained soldiers for combat during the Great War. It is believed, however, that Louis' company never traveled over the Atlantic Ocean to battle for the Allies in Europe. and became a naturalized citizen of the United States. Louis was mustered out of U.S. Army service on January 10, 1919, and returned to Gary. Soon after his return he ran afoul of the law. On October 7 and 13, 1919, he was tried in a criminal case (Case No. 752, State vs. Louis Desiderio) at Crown Point, Lake County, Indiana, though the particular details of the case are unknown. Approximately one month after Louis' criminal trial, on November 17, Louis' older brother Fiore filed for bankruptcy in federal court. At the time, Fiore was a merchant, with his business operating at 2025 Broadway Avenue in Gary. In his bankruptcy petition, Fiore lists his assets as $5,535 and his liabilities as $16,510. When he became a American citizen in 1931, his name was changed by order of the U.S. District Court in Chicago to Fred Desiderio, though he had been using the given name of Fred for many years. Louis can then found in 1921 operating a soft drinks business at 425 East 6th Street in Michigan City, LaPorte County, Indiana, approximately five blocks east of the present day Lighthouse Place Outlet Mall. Thus, it can be assumed that Louis had some familiarity with the roads between Gary and Michigan City. 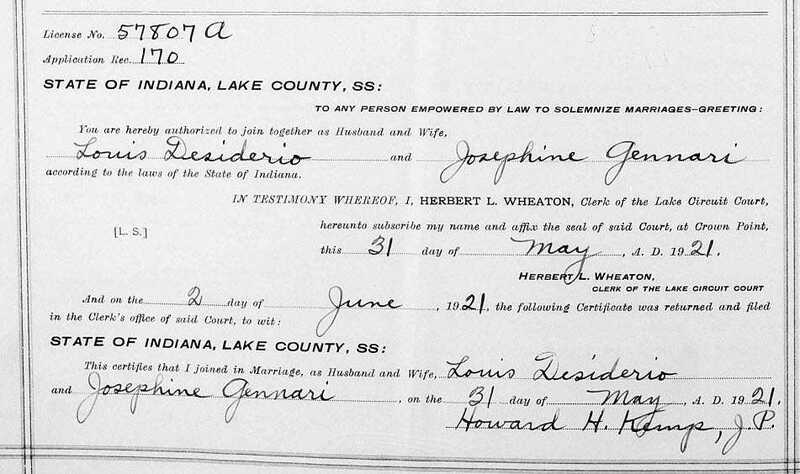 On May 31, 1921, Louis married Josephine Gennari in Lake County, Indiana. Howard H. Kemp, a Justice of the Peace, officiated their marriage. 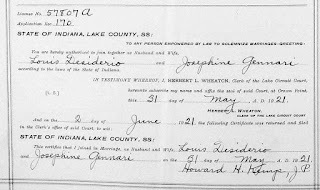 Numerous spellings of Josephine's surname exist in various records, these include Genaro, Genero, Generro, Gennari, Gennaro, Ginnero, and Jemerdo; it is believed that Gennaro is the correct spelling of Josephine's surname. Louis Desiderio and Josephine Gennari, May 31, 1921. 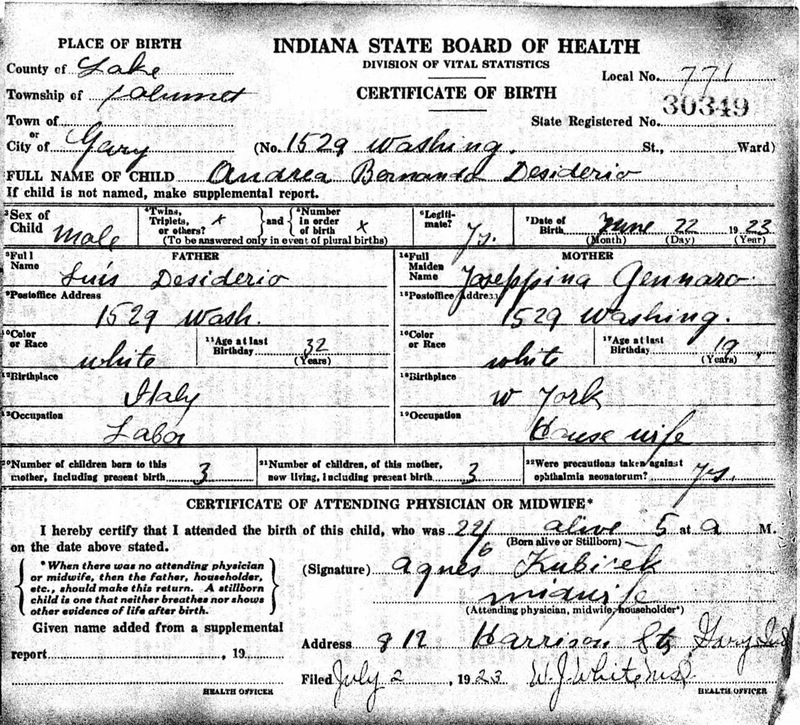 Source: Marriage Records of Lake County, Indiana, Volume 42, Page 322. 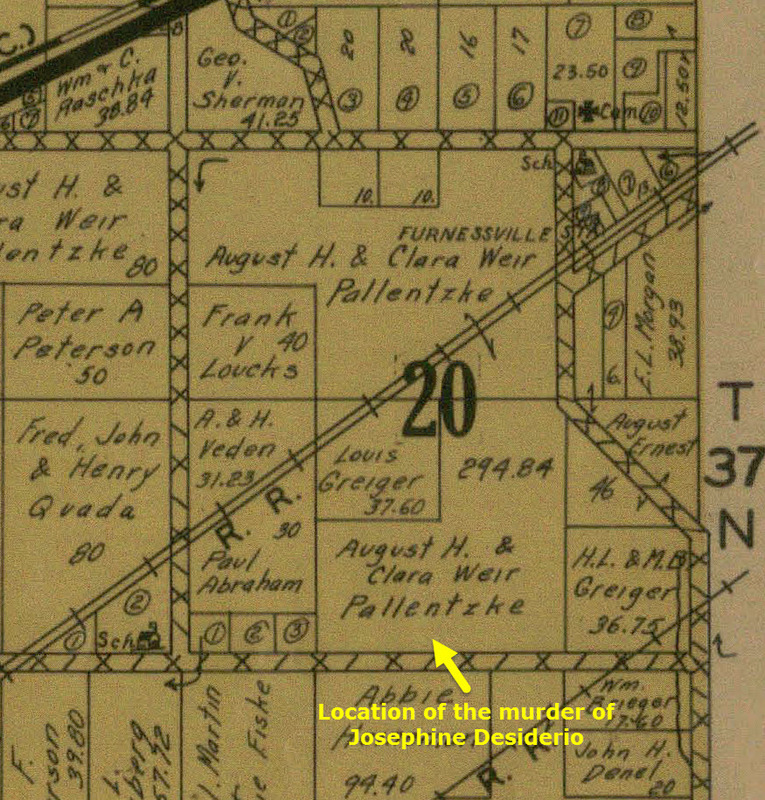 Some additional insight concerning Louis Desiderio can be gleaned from newspaper articles published at the time of Josephine's murder. As alluded to earlier, Louis had run afoul of the law prior to Josephine's demise. One newspaper account states that Louis "is well known to Gary police and formerly conducted a garage in Gary. He was suspected as a fence for stolen automobiles." Louis had also testified as an alibi witness in the Lake County trial of Nikola Trkulja, who was later convicted as an accessory in the armed robbery of the First State Bank of Tolleston on June 14, 1919 (Tolleston is a neighborhood in Gary). Sadly, Herman William Uecker, the cashier at the Tolleston bank, who was also a member of the Gary Board of Education, was murdered in the commission of this crime. Prior to the bank robbery, the seven individuals involved in it were, like Louis, well known by Gary police since they were trafficking in stolen automobiles; one of the men was a former Gary police officer. Four of these seven men were sentenced to death for the murder of Uecker, though all had their sentences later commuted to life terms upon retrial in the Porter Superior Court of Judge Harry L. Crumpacker. Brothers Albert and Tom Batchelor, of Valparaiso, were two of these four men. As is evident, Louis did not keep the best of company. Louis Desiderio did not simply vanish. A search through various databases slowly began to uncover Louis' whereabouts after the murder of Josephine; he apparently did not assume an alias. The first clue uncovered as to where Louis could be located appeared in a World War II Draft Registration Card completed April 27, 1942. His card reveals that that he was residing at 383 Essex Street in Lynn, Essex County, Massachusetts. His employer at the time was Happy Valley Cabins located at 480 Broadway in Saugus, also in Essex County. Grudo Lozzi, residing at 12 Rock Valley Street in Everett, Middlesex County, Massachusetts, is listed as Louis' primary contact. A 1942 city directory for Lynn, Massachusetts, lists Louis' occupation as a maintenance man at Happy Valley Cabins. 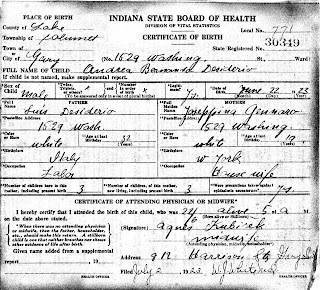 Louis is described in his World War II Draft Registration Card as being white, of ruddy complexion, 5 feet 7 inches in height, weighing 180 pounds, with black/gray hair, and brown eyes. Listed as "obvious physical characteristic that will aid in identification" was a "Scar over left eyebrow." 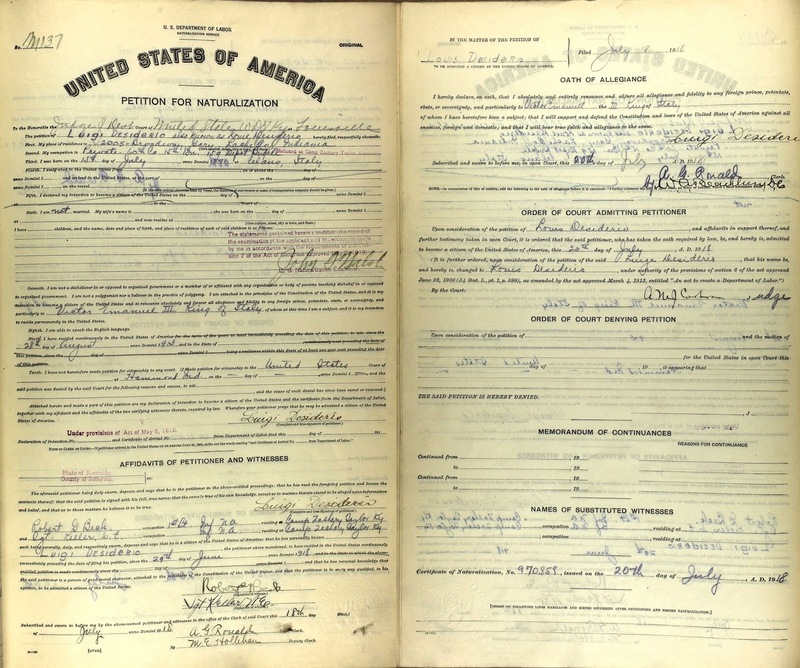 Most importantly, the date and location of birth provided on the card matches his 1918 naturalization documents. Thus, Louis could be pinned to Massachusetts in 1942. Registration Card, dated April 27, 1942. Additional research focusing on Massachusetts uncovered some startling facts. In 1927, two years after Josephine's murder, Louis had married Elvira Lozzi in Everett, Massachusetts; they appear in the Everett, Massachusetts, Marriage Records in volume 15, page 97. 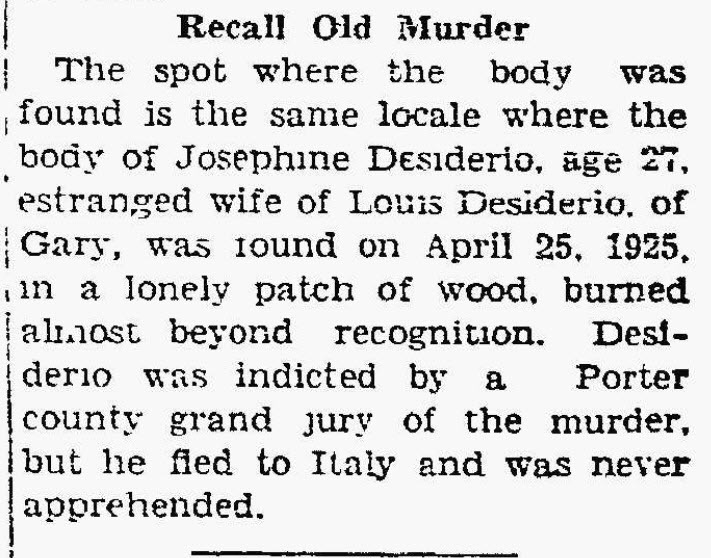 What makes this marriage a bit remarkable is that it is known for certain that a very active search for Louis Desiderio, who was under indictment for the first degree murder of Josephine, was still taking place as late as December 1929 by Porter County, Indiana, authorities. When Judge Grant Crumpacker dismissed ninety-five criminal actions on Friday [December 16], one case has been pending for more than four years without an arrest, was not stricken from the docket. 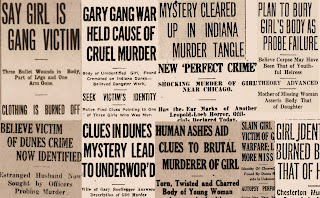 After extended investigation of the case by Sheriff W. B. Forney and Coroner A. O. Dobbins, the dead woman's body was established as that of Josephine Desiderio, wife of Luis Desiderio, a Chicago and Gary gangster. Because of jealousy and alleged unfaithfulness, Desiderio is alleged to have killed his young wife, mother of his three children. Who was Elvira Lozzi, the woman Louis married in 1927? Elvira had emigrated from Naples, Italy, at the age of 23, landing at Boston on February 10, 1921, aboard the S.S. Canopic; she was single and she listed her "final destination" as Everett, Massachusetts. Elvira was born in Aquila, Italy, her father being Feliciano Vittorito Lozzi. It appears that Elvira was commonly referred to as Vera. It is presumed that Louis Desiderio headed to Massachusetts after the murder of his wife Josephine and met Elvira there. 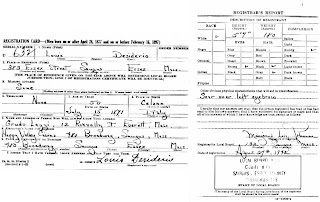 Both Louis and Elvira appear in the 1930 Federal Census enumeration for Everett, Massachusetts; they are listed as Louis and Alvira Disadary. 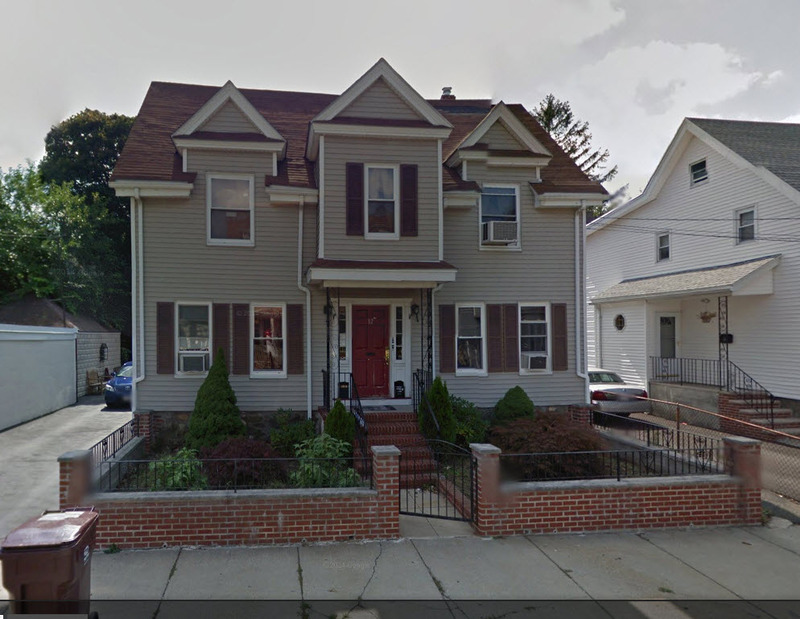 They are living at 12 Harrison Avenue with the Victor and Annie Lozzi family. Louis is shown to be employed in the acid room of a foundry, while Elvira is a machine operator at a dress factory. A city directory for Everett shows that Louis and Elvira were living as 12 Harrison Avenue as early as 1928, shortly after their marriage. County, Massachusetts, from 1928 to the early 1940s. 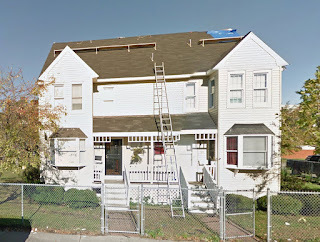 Louis and Elvira were still living at 12 Harrison Avenue address in 1932. The 1932 city directory lists Louis' occupation as a painter. In the 1940 Federal Census for Everett, Massachusetts, the couple appears as Lewis and Elvera DeSiderio. Louis is shown as being employed as a laborer working on a Works Progress Administration (WPA) sewer project, while Elvira is employed as a machine operator at Sexton Can Company. Later in the 1940s, they were living in Lynn, Massachusetts, at 383 Essex Street, and by the mid-1950s it is believed they had moved to Yucaipa, San Bernardino County, California, approximately 80 miles directly east of Los Angeles. Essex County, Massachusetts, from 1942 to 1953. 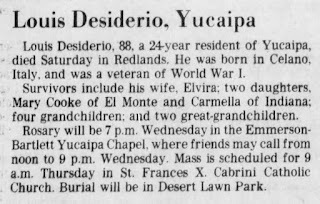 A search of the Find a Grave database revealed that a record exists for Louis Desiderio; he is buried at Desert Lawn Memorial Park at Calimesa in Riverside County, California, in plot VES 050-C. The record provides the correct date and location of Louis' birth. A published death notice indicates that Louis died on December 22, 1979, at Redlands, San Bernardino County, California. Engraved on Louis' tombstone is "PVT US ARMY, WORLD WAR I." Louis is buried alongside Elvira (Lozzi) Desiderio (b. March 28, 1898, d. December 25, 1989). Elivra's tombstone is engraved with "BELOVED WIFE." Louis Desiderio's published death notice. Contemporary reports of Josephine (Gennaro) Desiderio's death mention that she had three children with Louis, though the reports did not name these children. A search of birth and census records has led to the identification of all three children. 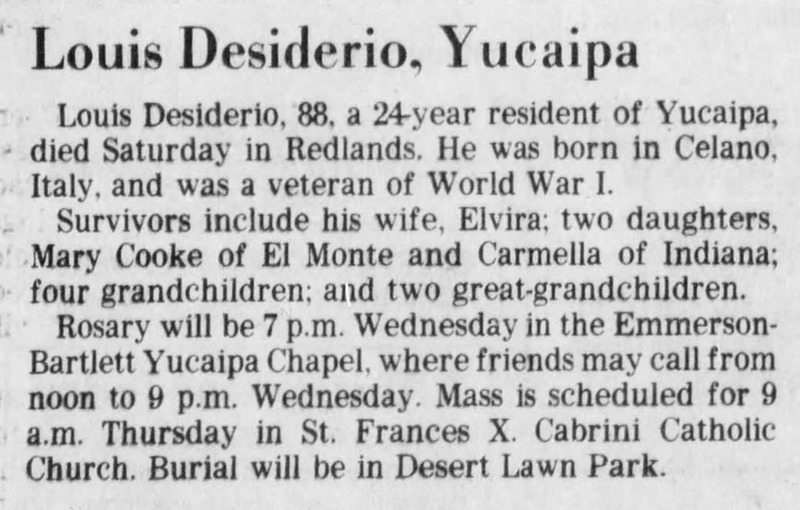 Louis' obituary from 1979 specifically mentions two children, a "Mary Cooke of El Monte [Los Angeles County, California] and Carmella of Indiana." These two children were indeed the children of Josephine. As reassurance that these are Josephine's children and not Elvira's, neither the 1930 or 1940 Federal Census data revel that Louis' second wife, Elvira (Lozzi) Desiderio, had given birth to children. On April 14, 1922, Josephine bore Maria Carmella Desiderio. 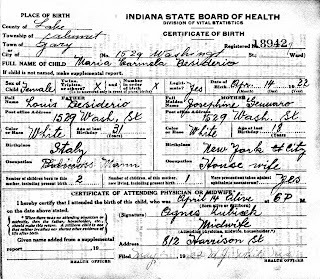 The birth certificate for this child shows that the Desiderio's were living at 1529 Washington Street in Gary (presently an empty brush filled lot one block west of Broadway Avenue). The birth certificate also reveals that Maria was Josephine's second child, but that her firstborn child was dead. Thus, counter to newspaper reports at the time of her murder, Josephine had given birth to four children. Confusion arises, however, since only three of these children were living at the time of Josephine's death. Carmela Desiderio. Certificate number 18942 filed May 2, 1922. Source: Indiana State Board of Health, Division of Vital Statistics. 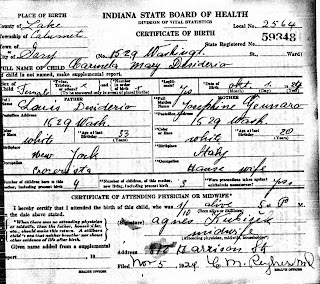 Maria Carmella Desiderio was apparently referred to by her middle name. Carmella died on November 14, 1989, in Las Vegas, Clark County, Nevada, according to information contained in the Social Security Death Index (SSDI) and the Nevada State Health Division's Office of Vital Statistics. Records indicate that she had married at least twice - to men with the surnames of Kukolovich and Hancock. Carmella married at the age of 18 to a 20 year old truck driver named Peter A. Kukolovich on December 3, 1939, in Seabrook, Rockingham County, New Hampshire. 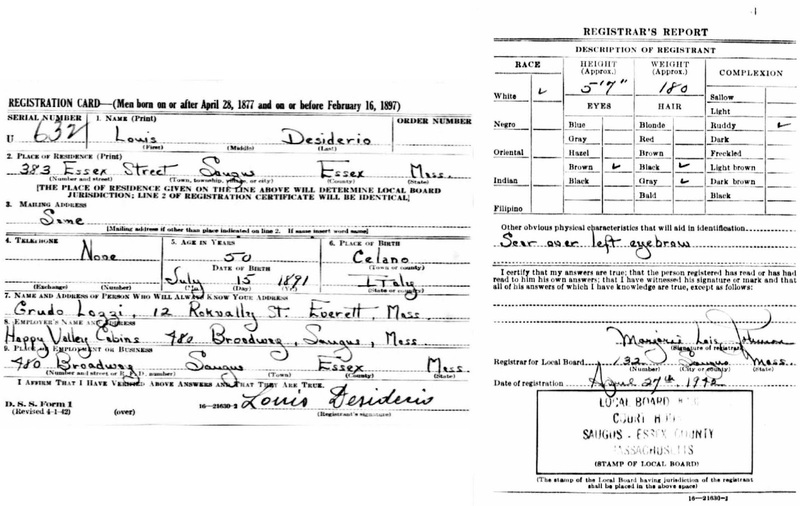 Their marriage intention record is interesting in that Louis Desiderio, living in Everett, Massachusetts, is listed as Carmella's father, while her mother is listed as Josephine Genaro, dead, from Gary, Indiana. At some point in time, Peter and Carmella changed their surname to Cooke. Peter Kukolovich and Mary Carmella Desiderio, 1939. Source: New Hampshire Bureau of Vital Records. The second identified child of Louis and Josephine was Andrea Bernardo Desiderio. Andrea is believed to have been commonly referred to as Andrew. This son was born on June 2, 1923, at 1529 Washington Street in Gary. Andrew appears in the 1940 Federal Census living in Shirley, Middlesex County, Massachusetts, where he was attending the Industrial School for Boys. The census information also indicates that in 1935 he was residing in Everett, Massachusetts, presumably with his father Louis and step mother Elvira. Andrew Desiderio passed away from a heart attack at the age of 51 on June 15, 1975, in his Gary home located at 4649 Maryland Street. His death certificate indicates that he was married to Helen (Brugos) Desiderio at the time of his death and that he was a retired chief petty officer of the United States Navy who had served in both World War II and the Korean War. Listed as Andrew's parents are Luigi Desiderio and Josephine Gennaro. Andrew is interred in Calumet Park Cemetery in Merrillville, Lake County, Indiana. Bernardo Desiderio. 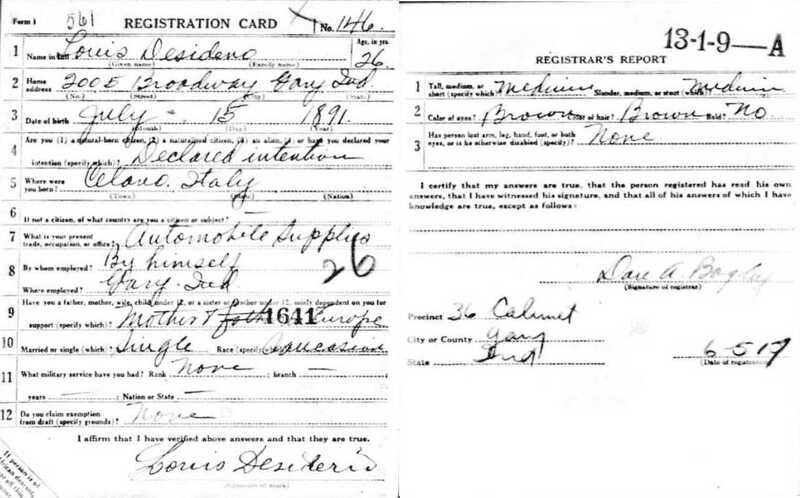 Certificate number 30349 filed July 2, 1923.
for Andrea Desiderio. Certificate number 75-0641 filed June 19, 1975. The third identified child of Louis and Josephine was Carmella Mary Desiderio, whose name, confusingly, is a derivative of her sibling's name. 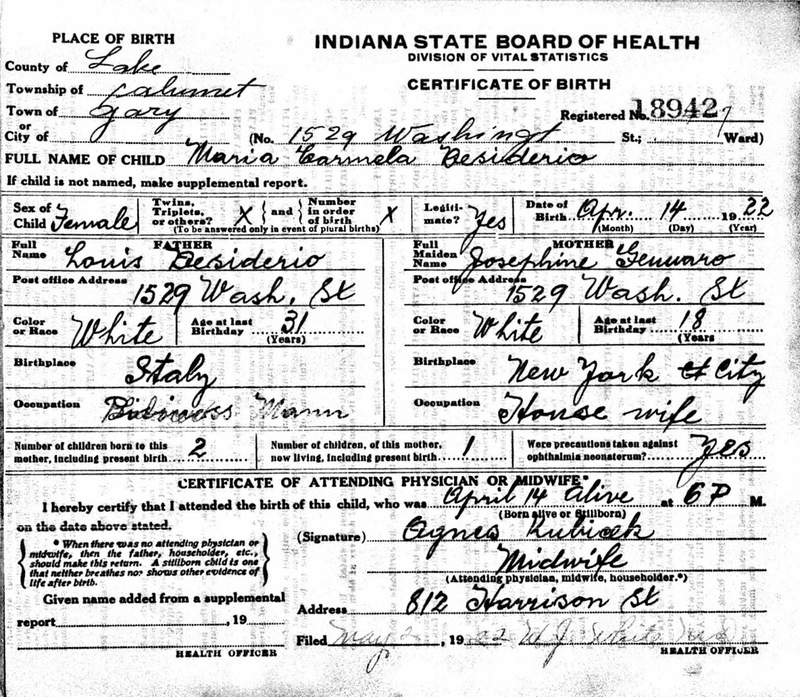 This child was born October 1, 1924, at 1529 Washington Street in Gary. 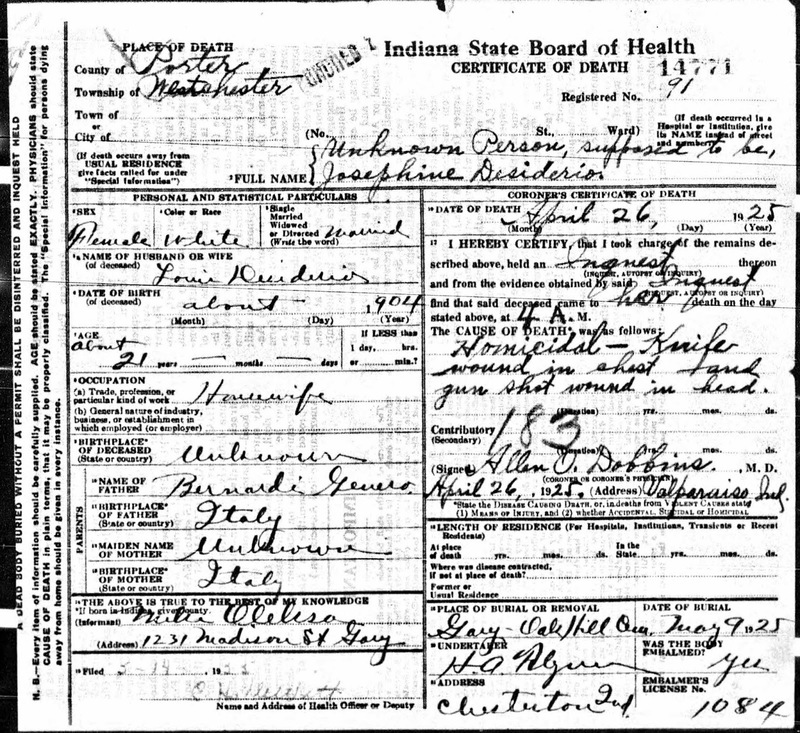 Carmella Mary appears in the 1930 Federal Census living at 3525 Adams Street in Gary, being listed as a five year old. 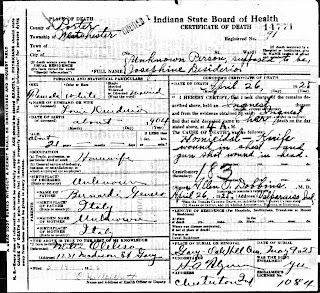 In this census enumeration, Carmella is living in the home of John L. Brown (age 45) and Gimilia Brown (age 26) and she is listed as John's granddaughter. Also residing in the household are John and Gimilia's children, Virginia (age 4 years, 5 months) and Charles (age 2 years, 8 months). Finally, Gimilia's parents are also living in the household; they are Charles R. Moody (age 60) and Gimilia Moody (age 63). Mary Desiderio. Certificate number 59348 filed November 5, 1924. The 1930 Federal Census data also indicates that Carmella's father was born in Italy and the her mother, Josephine, was born in New York. Little information could be found concerning this child of Louis and Josephine. 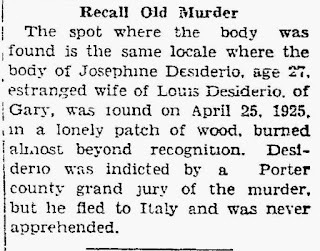 In a morbid but rather important historical twist, the murdered and charred remains of another individual were discovered on January 12, 1941, at nearly the same location where Josephine Desiderio's remains were found in 1925. In this incident, a "mulatto girl" was believed to have been murdered with a shotgun elsewhere and her body then dumped at the site, doused with motor oil or gasoline, and then set ablaze. Ira Wampler came across the human remains while walking along the road from his job at McDonald's sawmill near Furnessville. In a January 13, 1941, front page story concerning this murder, published in The Vidette-Messenger, the last paragraph recalls the remarkable similarities to the Desiderio murder more than 16 years earlier. The last sentence of the column states that "[Louis] Desiderio was indicted by a Porter county grand jury of the murder, but he fled to Italy and was never apprehended." Desiderio's had taken flight from justice by traveling to Italy. Following an extensive search through a variety of public records, it does not appear that Louis Desiderio was ever apprehended and brought to trial at Porter County, Indiana, for the murder of Josephine. A short article about the Desiderio murder published in the August 6, 1925, issue of The Chesterton Tribune states that Porter County Sheriff Forney "spent $300 of his own money on the case.... He had to quit because a lack of funds. He traced the husband to New York City, and there lost the trail." This same article ends with these foretelling sentences: "It is possible the murderer will never be brought to justice in this world, but it will not be the fault of Porter county's sheriff. Rather it will be the fault of our system of justice." Other remarks published in newspapers in 1929 and as late as 1941 reveal that it was believed that Louis had successfully made his way to Italy to avoid prosecution. If that was indeed the working theory of Porter County officials, then there would have been little, if any, effort expended to search for Louis within the United States. Furthermore, the Great Depression, followed by World War II, may have significantly altered the focus and use of police and prosecutorial resources in Porter County, and the Desiderio case simply faded from memory. Hence, it appears that Louis headed to Massachusetts shortly after the murder of Josephine. He married Elvira Lozzi in Everett, Massachusetts in 1927, and the couple soon began residing at 12 Harrison Avenue in Everett. 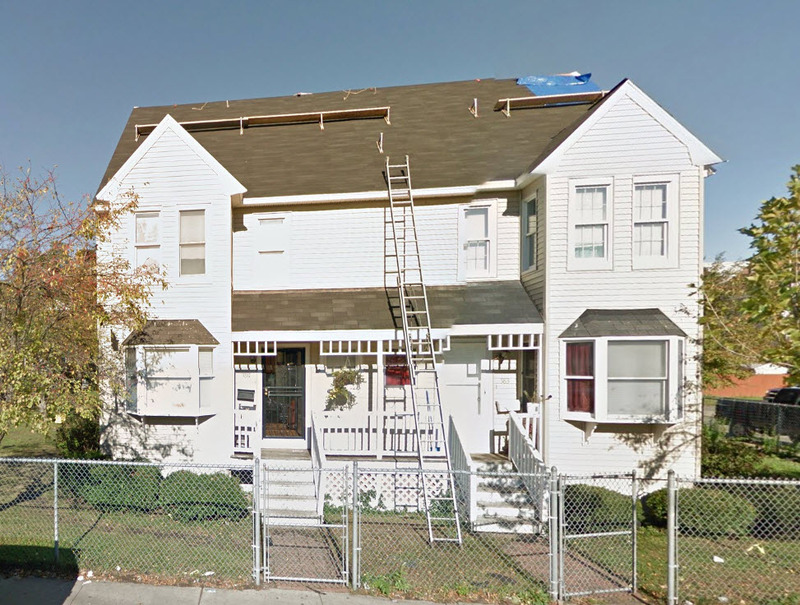 Later, the couple moved to 383 Essex Street in Lynn, Massachusetts, where they lived for at least eleven years before moving to Yucaipa, California. Louis lived in Yucaipa during the last 24 years of his life. Surprisingly, every public record uncovered during the research process for this story showed that Louis did not attempt to hide or change his identity after Josephine's death. He did not change his name. 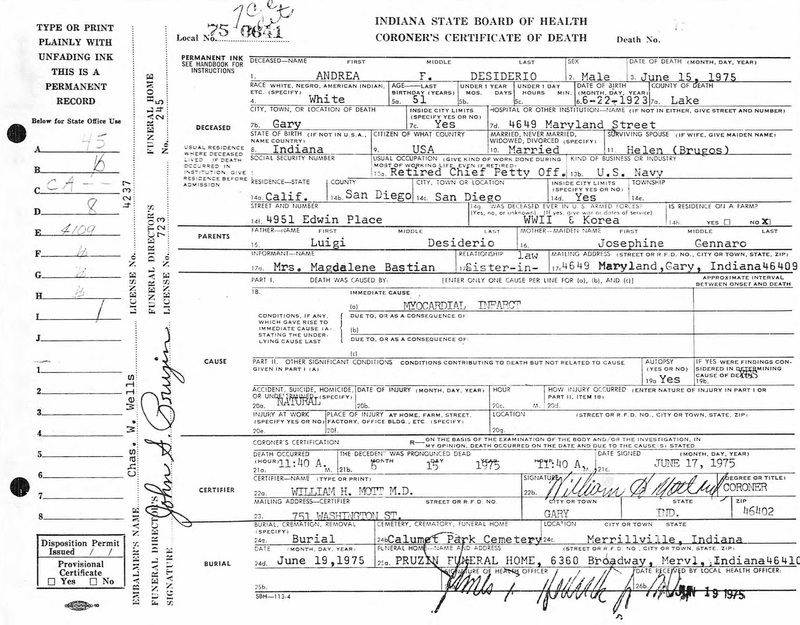 His date and location of birth are correctly stated in the records. And records plainly show that he had some interaction with the children that he fathered with Josephine. One is left to wonder if the Desiderio children ever learned about the circumstances surrounding their mother's death. Or whether they knew that their father was wanted for the crime of first degree murder in Porter County, Indiana. What did Elvira, Louis' second wife, know about Josephine? What they did know about Josephine's murder they took to their graves. Authorities in Porter County mistakenly believed that Louis had avoided prosecution by fleeing to Italy. The search for Louis appears to have abruptly ended. Perhaps The Chesterton Tribune was correct in suggesting that Josephine was a victim of murder and a "fault of our system of justice?" A. I. Silander & Company. 1928. Plat Book: Porter County, Indiana. Rockford, Illinois: The Thrift Press. 58 p.
Smith, Edgar. 1913. Smith's Directory of Gary, Indiana for 1913, Vol. 2. Gary, Indiana: Edgar Smith. National Archives and Records Administration. 1918. Naturalization Records of District Courts. Louisville, Kentucky, Declarations, Petitions, and Index. Military Petitions. NARA Series M1547, Roll 072. Washington, D.C.: National Archives and Records Administration. National Archives and Records Administration. 1942. Draft Registration Card for Fourth Registration for Massachusetts, April 27, 1942. NARA Records of the Selective Service System, Record Group Number 147, Series M2090. Washington, D.C.: National Archives and Records Administration. The Chicago Daily Tribune, Chicago, Cook County, Illinois; June 28, 1919; Volume 78, Number 154, Page 7, Column 1. Column titled "Trap Tolleston Slayer, 6 Aids, on Woman's Tip. Saved from Freezing by Police, She Betrays Bank Raid Gang." The Indianapolis Star, Indianapolis, Marion County, Indiana; June 28, 1919; Volume 17, Number 23, Page 1, Column 2. Column titled "Seven Arrested for Holdup and Murder in Gary Bank." The Lake County Times, Hammond, Lake County, Indiana; October 3, 1919; Volume 14, Number 91, Page 1, Column 3. Column titled "Criminal Court Settings for Monday." The Indianapolis News, Indianapolis, Marion county, Indiana; November 18, 1919; Volume 50, Number 297, Page 3, Column 5. Column titled "Petition for Bankruptcy." Appleton Post-Crescent, Appleton, Outagamie County, Wisconsin, April 27, 1925; Volume 41, Number 272, Page 1, Column 1. Column titled "Find Girl's Body Hacked and Burned. Sleuths Seek Murderers of Young Victim. Police Have as Few Clews to Work on as Were Found in Bobbie Franks' Case. Was Hacked to Pieces in Order to Cover Identity, Authorities Declare." The Daily Northwestern, Oshkosh, Winnebago County, Wisconsin; April 27, 1925; Volume 57, Page 2, Column 5. Column titled "Girl Brutally Slain on Lone Indiana Road." The Indianapolis News, Indianapolis, Marion County, Indiana; April 27, 1925; Volume 66, Number 121, Page 30, Page 3. Column titled "Body Shot, Burned and Mutilated Found. Coroner Believes Girl Was Thrown From Auto, Killed. Articles Found Nearby"
The Lincoln State Journal, Lincoln, Lancaster County, Nebraska; April 27, 1925; Volume 43, Page 12, Columns 1-2. Column titled "Murder a Brutal One. Girl's Charred Body Found Near Gary." Bluefield Daily Telegraph, Bluefield, Mercer County, West Virginia; April 28, 1925; Volume 33, Number 99, Page 13, Column 3. Column titled "Leg and Arm Cut Off After Death. Indiana and Illinois Authorities Combine Forces in Effort to Identify Girl Victim of Murder at Chesterton." The Bee, Danville, Pittsylvania County, Virginia; April 29, 1925; Number 8560, Page 1, Column 7. Column titled "Girl's Body is Not Identified Yet by Police. Tracing Dental Work Begun -- Missing Legs and Right Arm of Young Woman Expected To Be Found In Lake -- Other Articles Found." Chicago Daily Tribune, Chicago, Cook County, Indiana; April 29, 1925; Volume 84, Number 102, Page 1, Column 7 and Page 5, Column 2-3. Column titled "Spectacles Key to Woman's Murder at Dunes: Dog Recovers Gray Slipper Victim Wore." The Chesterton Tribune, Chesterton, Porter County, Indiana; April 30, 1925; Volume 42, Number 8, Page 1, Column 6 and Page 2, Columns 4-6. Column titled "Woman Murdered by Unknown Fiend. Body Found on Mosquitotown Road Sunday. Shot, Stabbed and Burnt to a Crisp." The Kingsport Times, Kingsport, Sullivan County, Tennessee; April 30, 1925; Volume 10, Number 104, Page 1, Column 1. Column titled "Officials Fail to Identify Body of Woman Found Sun. Thousands of Persons View the Body Today. Every Step In Police Efforts to Establish Identity Lead to Practically Nothing." The Daily Independent, Murphysboro, Jackson County, Illinois; May 1, 1925; Page 1, Column 1. Column titled "Sand Dunes Victim was Love Woman. Fluttered About White Lights of Gary Night Life Until Louie Desiderio, Fiercely Jealous, Sought to Kill Her -- Mate Missing -- May Not be Killer, Though Bootlegger and Gunman." Dixon Evening Telegraph, Dixon, Lee County, Illinois; May 1, 1925; Volume 75, Number 103, Page 1, Column 3. Column titled "Believe Victim of Dunes Crime Now Identified. Estranged Husband Now Sought by Officers Probing Murder." Logansport Pharos-Tribune, Logansport, Cass County, Indiana; May 1, 1925, Volume 4, Page 1, Column 6. Column titled "Dunes Girl Identified. Butterfly of Gary's Slums was Victim. Police are Seeking Husband, Known as Gun toting Bootlegger." The Huntington Press, Huntington, Huntington County, Indiana; May 2, 1925; Volume 14, Number 105, Page 1, Columns 5-7. Column titled "Husband of Woman Believed to be Gary Murder Victim is Taken Into Custody by Chicago Police." The Evening Republic, Columbus, Bartholomew County, Indiana; May 2, 1925, Volume 48, Number 105, Page 1, Column 6. Column titled "Death of Girl Near Gary is Again Mystery. Identification Made Yesterday Upset by Man Who Saw Missing Woman. Five Men Being Held. Questioning Thus Far Fails to Throw Light on Tragedy of Charred Body Found Sunday." The Daily Gazette, Sterling, Whiteside County, Illinois; May 4, 1925; Volume 70, Number 105, Page 1, Column 6. Expect Arrests in Gary Murder. Chum of Mrs. Desiderio on Party Identifies Body of Her Companion." Belvidere Daily Republican, Belvidere, Boone County, Illinois; May 5, 1925; Volume 34, Page 1, Column 6 and Page 4, Column 3. Column titled "Extend Search for Desiderio. Gary Murder Victim Young Wife, Belief." Carbondale Free Press, Carbondale, Jackson County, Illinois; May 5, 1925; Volume 22, Number 74, Page 1, Column 6. Column titled "Seek Woman's Husband to be Her Murderer." The Milwaukee Sentinel, Milwaukee, Milwaukee County, Wisconsin; May 5, 1925; Number 31989, Page 1, Column 2. Column titled "Parents Drop Doubts, Claim Woman's Body. Friend Again Tells Desiderio Threats Against Wife." The Times-Picayune, New Orleans, Orleans Parish, Louisiana; May 6, 1925; Volume 89, Number 102, Page 13, Column 4. Column titled "Seek Girl Victim's Husband as Slayer." The Chesterton Tribune, Chesterton, Porter County, Indiana; May 7, 1925; Volume 42, Number 9, Page 1, Column 1 and Page 3, Columns 2-4. Column titled "Murder Mystery Still Unsolved. Murder Victim Unidentified." The Chesterton Tribune, Chesterton, Porter County, Indiana; May 7, 1925; Volume 42, Number 9, Page 1, Columns 3-4. Column titled "Coroner's Description of Murdered Woman." The Chesterton Tribune, Chesterton, Porter County, Indiana; May 7, 1925; Volume 42, Number 9, Page 1, Column 6. Column titled "Genero Puts It Up to Coroner." The Chesterton Tribune, Chesterton, Porter County, Indiana; May 14, 1925; Volume 42, Number 10, Page 1, Columns 1-2 and Page 2, Columns 2-3. Column titled "Gary Woman is Murder Victim." The Chesterton Tribune, Chesterton, Porter County, Indiana; May 14, 1925; Volume 42, Number 10, Page 1, Column 5. Column titled "Murder Victim Buried; Husband Being Sought. The Chesterton Tribune, Chesterton, Porter County, Indiana; May 14, 1925; Volume 42, Number 10, Page 2, Column 1. Column titled "Juries and Killings." The Chesterton Tribune, Chesterton, Porter County, Indiana; May 21, 1925; Volume 42, Number 11, Page 12, Column 2. Column titled "Social and Personal." The Chesterton Tribune, Chesterton, Porter County, Indiana; August 6, 1925; Volume 42, Number 22, Page 2, Columns 3-4. Column titled "Sheriff Still at Work on Desiderio Murder." The Vidette-Messenger, Valparaiso, Porter County, Indiana; May 31, 1929; Volume 2, Page 1, Column 8 and Page 3, Column 4. Column titled "Body of Woman Found in Swamp Near Hebron. Skull Victim is Crushed in Heavy Blow." The Vidette-Messenger, Valparaiso, Porter County, Indiana; December 21, 1929; Volume 3, Page 1, Column 2-3. Column titled "Another of the Many 'Unsolved' Porter County Crimes Stricken from Docket by Crumpacker." Garrett Clipper, Garrett, DeKalb County, Indiana; December 30, 1929; Volume 45, Number 22, Page 3, Column 2. Column titled "Charge of Murdering Wife Dropped from Docket. 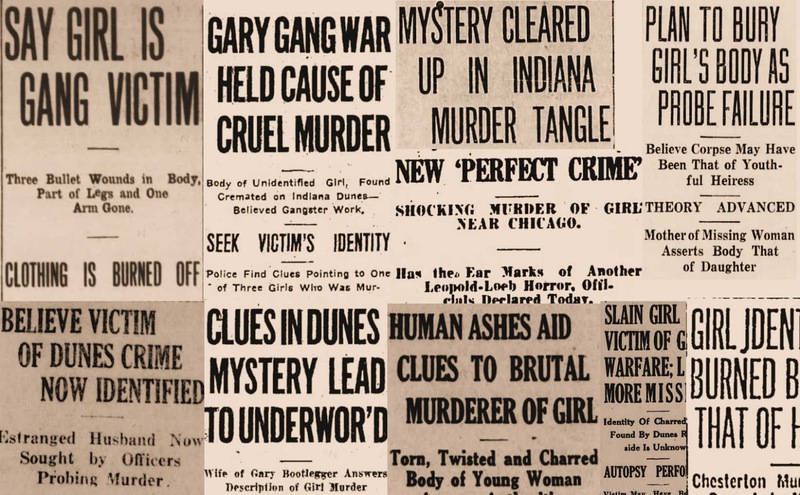 Court Action at Valparaiso, Ind., Recalls Grewsome Slaying in 1925." The Vidette-Messenger, Valparaiso, Porter County, Indiana; January 13, 1941; Volume 14, Page 1, Column 8. Column titled "Murder Victim Found Near U.S. 20. Woman's Body Discovered in Shallow Ditch. Young Mulatto Slain, Attempt Made to Burn Remains, Is Coroner's Verdict. Victim Not Yet Identified." The Chesterton Tribune, Chesterton, Porter County, Indiana; January 16, 1941; Volume 57, Number 42, Page 1, Column 2. Column titled "Murder Woman and Burn Body." The Sun, San Bernardino, San Bernardino County, California; December 24, 1979; Volume 106, Number 358, Page B-2, Column 1. Column titled "Obituaries. Louis Desiderio, Yucaipa." © 2016 Steven R. Shook. All Rights Reserved. Thanks Steve - great research! Thank you, Jon. Do you happen to be any relation to Amos J. Casbon, who served as a grand juror on this murder case?